When you’re in sightseeing in Bangkok and other parts of Thailand, you will sometimes see these fish mobiles. Originally they were made from palm leaves, but nowadays they are often made from plastic bottles. 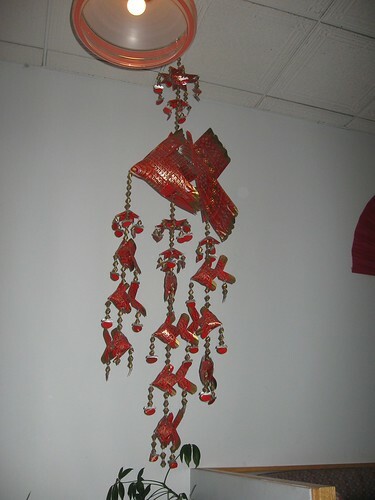 Even with the plastic bottles, it’s an ancient kind of toy or decoration for your house. And since plastic is nowadays a material that is quite more common than palm leaves, it’s just a way how the simple folk arts keep up with modern life. See it as a kind of environmentally friendly recycling art – much better than the bottle being thrown into some river.